The comparative allows you to compare things. No kidding right? Now, you can compare things using adjectives (so the word that qualifies the thing you are comparing) using adverbs (the word that qualifies the action that the thing you are comparing is doing), the noun itself or a verb (or action itself). This is sounding far more complicated than it really is. Let's look at a nice little example. 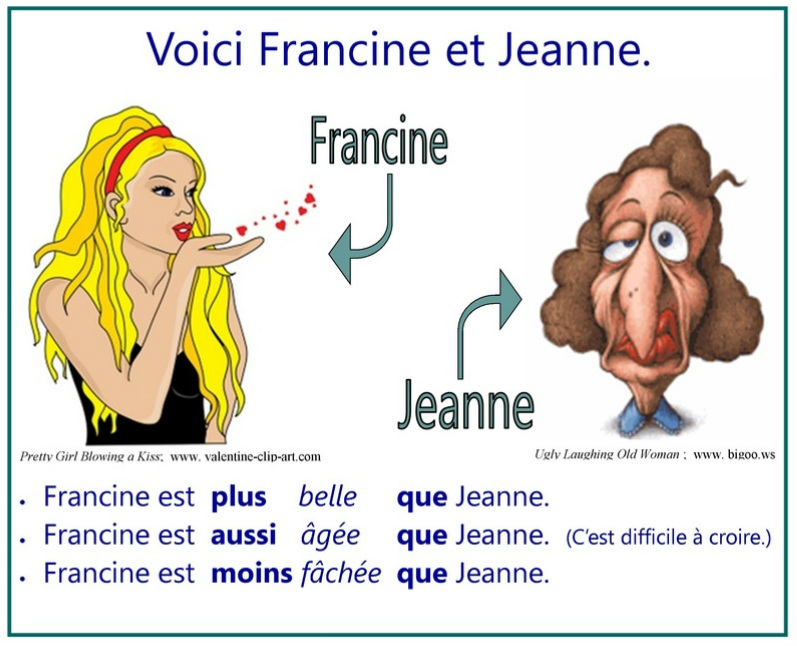 We'll ask Francine and Jeanne to help us. I didn't bother coming up with a silly picture as you would do the same thing as with adjectives but I will provide some simple examples here. Je mange plus lentement que mon frère. I eat slower than my brother. Elles travaillent aussi fort que leurs amis. They work as hard as their friends. Nous chantons moins doucement que les autres. We sing less softly than the others. This time we have a little angel and a little...non-angel helping us. The two irregular adjectives you're going to need to worry about are the same ones that change in English. The same is true for the comparable adverbs. The dark blue sentences are examples of the irregular adjectives while the turquoise sentences are examples of the adverbs at work. We can also compare nouns. This usually has something to do with the quantity we have of something. The formula is similar. This time I've asked poor Paul to help us. Literally poor Paul. He hates Jacques by the way. 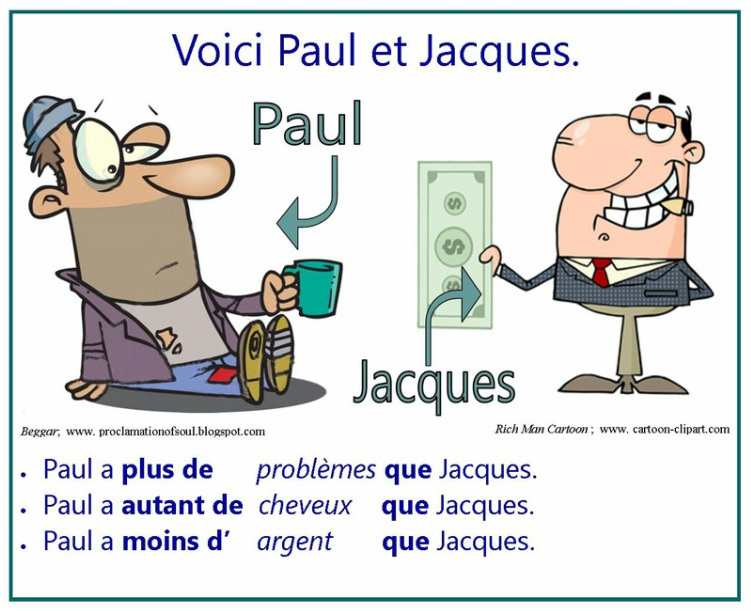 The verb goes before the comparative, not in between it and the word "que". 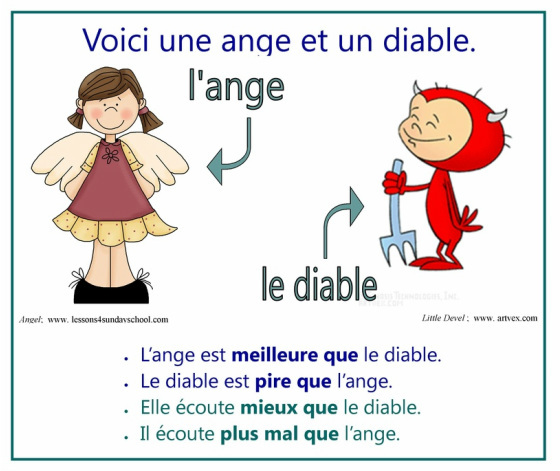 The little preposition "de" is not a part of the equation. Again, no silly picture as you would do the same thing as with nouns but I have some simple examples here. Je mange plus que mon frère. I eat more than my brother. Elles travaillent autant que leurs amis. They work as much as their friends. Nous chantons moins que les autres. We sing less than the others. The superlative helps indicate when something is the best or the worst or the most of something. Obviously, there is no "as good as" or "as much as" with the superlative. It is the extreme of some sort of quality. It's really quite simple to construct. 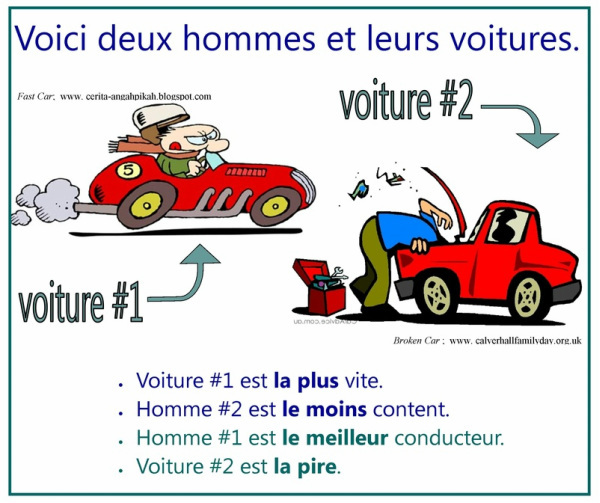 You simply need to make note of whether or not something is masculine or feminine or plural, add the word "plus" or "moins" and then the comparative (yes, I said comparative; the rules you learned there are the same here) you would like to use. Ces voitures sont les plus célèbres de la ville. These cars are the most famous of the city. N.B. The blue sentences in the picture contain regular adjectives, the green ones show the irregular forms "best" and "worst".